INDIANAPOLIS (Monday, April 30, 2018) – A new Indy car tested at Indianapolis Motor Speedway, but it was the old guard leading the way. 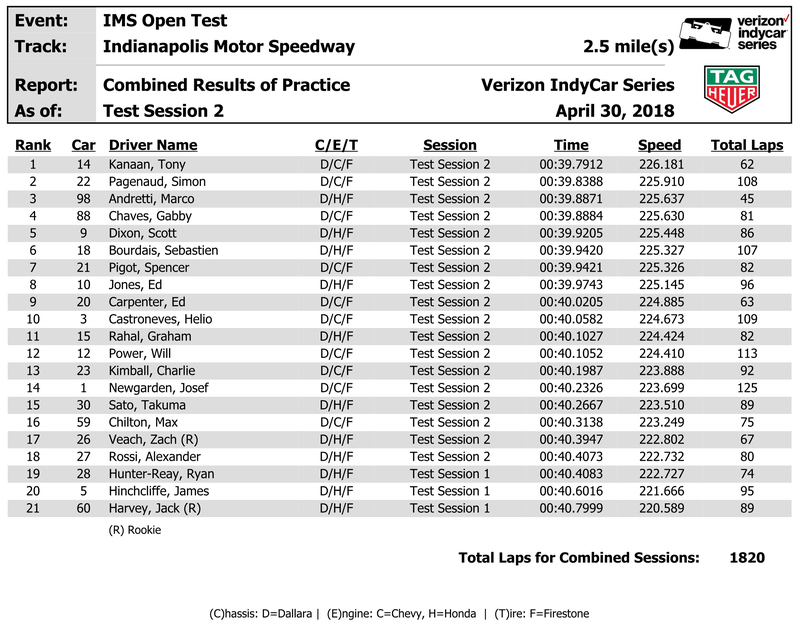 Tony Kanaan, at 43 the elder statesman in the Verizon IndyCar Series this season, was fastest in Monday’s open test at the 2.5-mile oval for drivers with previous Indianapolis 500 experience. The 2013 Indy 500 winner and driver of the No. 14 ABC Supply AJ Foyt Racing Chevrolet posted a top lap of 226.181 mph to lead the 21-car field following six hours of on-track activity. “Every year we come back (to Indianapolis) the first day, everybody has a huge smile on their faces,” Kanaan said. “I love it, I love this place. I mean, it’s magical. I wish we could do this every race. Simon Pagenaud was second fastest in the No. 22 Menards Team Penske Chevrolet, at 225.910 mph, with Andretti Herta Autosport with Curb-Agajanian’s Marco Andretti third at 225.637. While all the drivers’ best laps were aided by aero tows from cars in front of them, Kanaan also racked up the fastest non-tow lap of 223.240 mph. 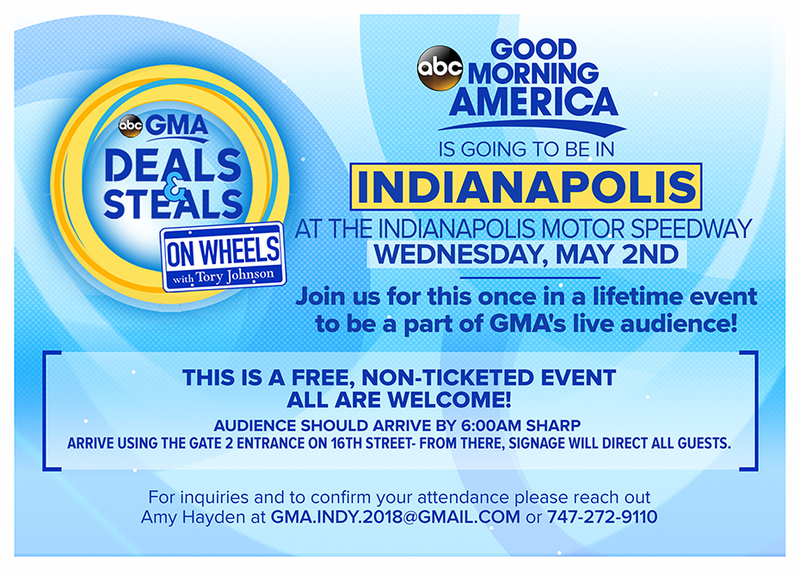 The open test allowed drivers and teams to become acclimated with the 2018 Indy car and its universal aero kit in superspeedway trim, in advance of the 102nd Indianapolis 500 presented by PennGrade Motor Oil on Sunday, May 27 (11 a.m. ET, ABC and Advance Auto Parts INDYCAR Radio Network). More than 1,800 laps were turned as teams ran alone and in small groups to better understand the nuances of the new package. “I think it was pretty smooth,” Kanaan said. “You saw everybody came up to speed pretty fast, which is pretty remarkable, in my opinion. To me, it was a lot quicker down the straightaways, which was quite fun. It was like back in the day. Castroneves placed 10th on the test speed chart with a lap of 224.673 mph in the No. 3 Pennzoil Team Penske Chevrolet, but was giddy to be back in the surroundings that have treated him so well in his two-decade Indy car career. “It’s great to be back … awesome,” said Castroneves, who will join Kanaan as a 43-year-old on May 10. Four other past Indy 500 winners participated in the open test. Scott Dixon, the 2008 winner who competed late Sunday night in the city qualifier for NBC’s “American Ninja Warrior” held in downtown Indianapolis, was fifth in testing in the No. 9 PNC Bank Chip Ganassi Racing Honda (225.448 mph); defending race winner Takuma Sato was 15th in the No. 30 Mi-Jack/Panasonic Honda for Rahal Letterman Lanigan Racing (223.510), 2016 winner Alexander Rossi was 18th in the No. 27 NAPA AUTO PARTS Honda (222.732) and Andretti Autosport teammate Ryan Hunter-Reay 19th in the No. 28 DHL Honda (222.727). IMS testing continues Tuesday with the rookie orientation program for newcomers Pietro Fittipaldi, Kyle Kaiser, Matheus “Matt” Leist and Robert Wickens set for 10 a.m.-1 p.m. ET. Danica Patrick makes her return to Indy car racing official during a veteran refresher session from 2-5 p.m. that also includes Jay Howard and Sage Karam. A Chevrolet and Honda manufacturer test day is scheduled from 9 a.m.-5 p.m. Wednesday and will feature 11 drivers. Following the open test, Verizon IndyCar Series points leader Josef Newgarden ran laps in his No. 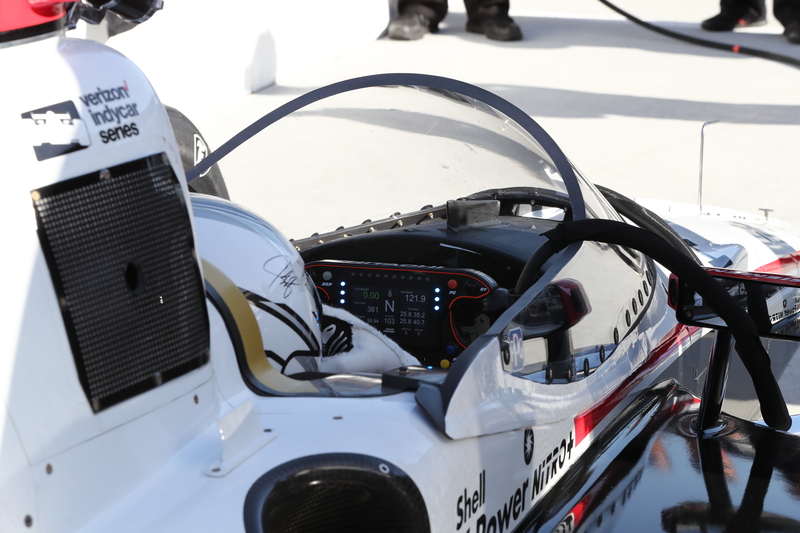 1 Hitachi Team Penske Chevrolet with INDYCAR’s windscreen prototype attached. It was the second on-track test of the prototype, following one in February by Dixon on the ISM Raceway mile oval outside Phoenix. “It was fascinating,” Newgarden said. “It was totally different for an open-wheel car. You’re not used to having a windscreen that big in front of you, but it was interesting to try it out. “The most interesting thing to me was the visor changes (on his helmet). Going from a fully smoke visor to a clear visor was better. It helped with the visibility and the clarity. Additional testing of the prototype is planned. INDYCAR has not issued a timetable for implementation of the windscreen on cars in competition. Indianapolis, Ind. (April 30, 2018) – Team Pelfrey announced today Davey Hamilton Jr. will compete with Team Pelfrey Indy Lights at the iconic Indianapolis Motor Speedway for the Freedom 100, on May 25. The 21-year-old Idaho-resident returns to Indy Lights after he made his debut in 2016 for the final two races at Laguna Seca. Hamilton’s racing as of late includes the Robby Gordon Stadium Super Truck series, Sprint Cars and USAC Silver Crown series. Hamilton Jr. will turn his first laps in the Team Pelfrey Mazda this morning at Kentucky Speedway before the series open test at the Indianapolis Motor Speedway on Monday, May 21. The Freedom 100 takes place on Friday, May 25 at 12:30 p.m. ET live on NBC Sports Network. Team Pelfrey’s winning heritage dates back to 2011, initially fielding cars in the ultra-competitive Pro Mazda Championship on the Mazda Road to Indy. Since then, Team Pelfrey has won Pro Mazda Championship titles in 2011, 2012, 2015, 2016 and 2017. The team’s winning pedigree has since expanded to the F1600 Championship, USF2000 Championship and Indy Lights series, becoming the first team to compete on all rungs of the Mazda Road to Indy Ladder. To date, the team has achieved 96 race wins, 206 podium finishes and nine championships. The National Association for Stock Car Auto Racing, Inc. (NASCAR) is the sanctioning body for the No. 1 form of motorsports in the United States. NASCAR consists of 3 national series (Monster Energy NASCAR Cup Series™, NASCAR XFINITY Series™, and NASCAR Camping World Truck Series™), 4 regional series, one local grassroots series and 3 international series. The International Motor Sports Association™ (IMSA®) governs the IMSA WeatherTech SportsCar Championship™, the premier U.S. sports car series. Based in Daytona Beach, Fla., with offices in eight cities across North America, NASCAR sanctions more than 1,200 races in more than 30 U.S. states, Canada, Mexico and Europe. For more information visit www.NASCAR.com and www.IMSA.com, and follow NASCAR on Facebook, Twitter, Instagram, and Snapchat (‘NASCAR’).